After arriving at the Philadelphia Airport and meeting up with Dani, Heather and Nancy, we found our driver and headed off to Bethlehem, PA where Runner's World was setting us up in a hotel. After checking in...we were given these rather amazing swag bags filled with goodies from the race sponsors! After a quick photo of the goodies, we headed off to a bar around the corner for a quick drink and meet and greet. Before you knew it, we were meeting in the lobby and loading up in the van heading toward Runner's World Headquarters for dinner, s'mores, a tour and our Altra fitting. Dinner was from the Runners World Cookbook Meals on the Run. It was so yummy I wanted to go back for 2nds and 3rds but I restrained myself. Trust me. That was hard! Shortly after that we were greeted by the Altra team and fitted with our new shoes! I was given the Torins. I am seriously in love with this shoe! Personal fittings from Golden Harper - the man behind Altra! Talk about first class treatment! He explained how a shoe really needs to fit. Not snug. You need at about a thumbs width. He even said "if it feels too big, then they are the right fit". Then we headed outside for a little dessert around the fire pit with s'mores. S'mores are always a favorite of mine! Makes me think of summer.... boy do I miss summer. Can it come back please? S'mores at Runner's World...with new Altras. Yes! and even better? S'mores with Deena Kastor! Heck yes! Oops.... me sneaking in a selfie with Deena in the background. Can you tell I was starstruck? Pretty cool to put my twitter/instagram handle on the Runner's World Wall! Next up was the tour lead by Bart Yasso, himself! Getting to see the behind-the-scenes of your favorite running magazine ever is something rather special. Bart showed us some rather cool wood carvings. Desk top treadmill anyone? Bart doesn't use it himself... but I could see myself loving this set up! Flat Bartie anyone? I think my classroom needs one of these! Don't you agree? 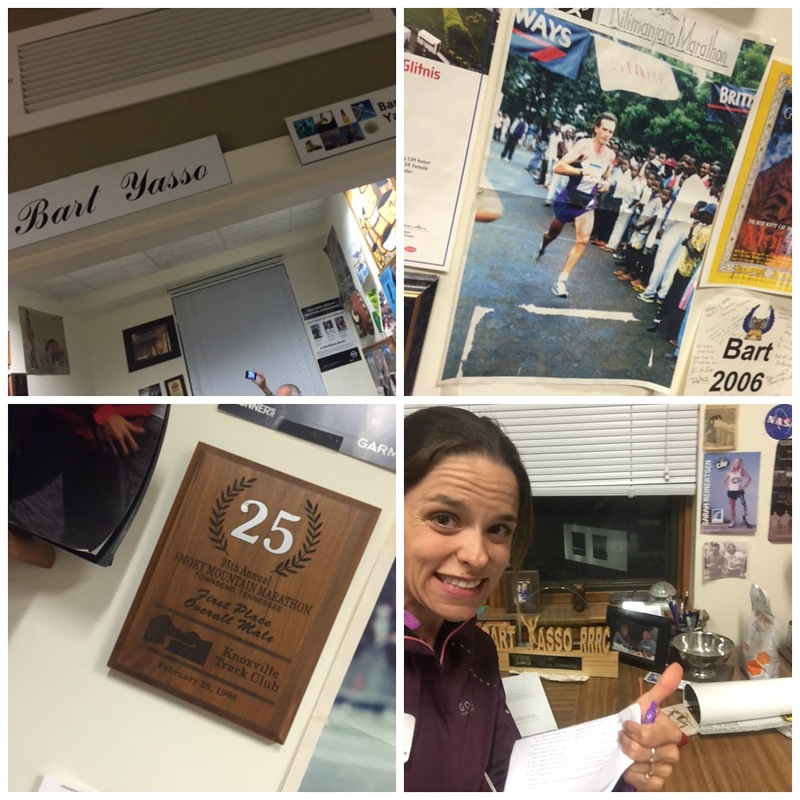 Bart's office was packed with trophies, bib numbers, race photos. It was inspiring to say the least. And of course, a selfie with Bart outside his office! and I couldn't leave out a selfie with Jeremy from Altra! As you can tell - I was beyond excited on day 1! Even as I type this, I'm still thinking "how in the world did I get so lucky to have this opportunity?" Stay tuned for the race recaps!